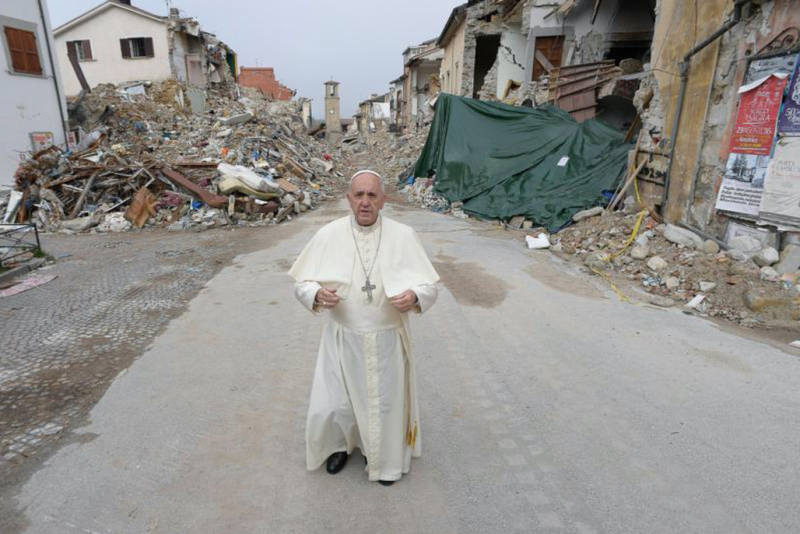 VATICAN CITY (CNS) — Amid the devastation wrought by an earthquake in central Italy, Pope Francis quietly prayed and offered words of consolation to survivors and those assisting in relief efforts. “From the first moment, I felt that I needed to come to you! Simply to express my closeness to you, nothing more. And I pray; I pray for you!” the pope said Oct. 4. The epicenter of the earthquake was close to Norcia, the birthplace of St. Benedict, and had a magnitude of 6.2, according to the U.S. Geological Survey. Shortly after news of the quake, the pope had led 11,000 pilgrims in St. Peter’s Square in praying the rosary for the victims. He also sent six Vatican firefighters and six Vatican police officers to Amatrice to help search for victims trapped under the rubble. During his flight to Rome from Azerbaijan Oct. 2, the pope told journalists that while he was unsure when he would visit the towns devastated by the earthquake, he wanted to do it alone. “I will do it privately, alone, as a priest, bishop and pope. But alone. That’s how I want to do it and I want to be close to the people,” he said. Two days later, the pope, accompanied by Bishop Domenico Pompili of Rieti, visited the newly-built Capranica Elementary School in Amatrice and greeted the students individually before making his way to the “red zone,” an area completely destroyed by the earthquake and cordoned off due to safety concerns. Looking over the rubble where the town center once stood, the pope prayed in silence for the victims of the quake. Pope Francis also visited the St. Raphael Borbona Assisted Living Facility in Rieti where he greeted each of the home’s 60 elderly patients and ate lunch with them. Before departing Amatrice for the neighboring towns of Accumoli and Arquata del Tronto, the pope told the crowd gathered around him that he had two simple gifts for them. After giving them his blessing, Pope Francis led the people in praying a Hail Mary for those who died.